POPLAR BLUFF, Mo. 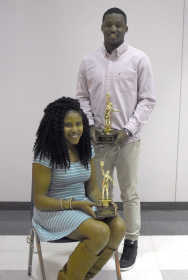 -- Tyeshia Mitchell became the first Sikeston player in program history to win the Bob Gray Award while Cape Central standout Al Young added the John Gibbs Award to his trophy collection Wednesday night. 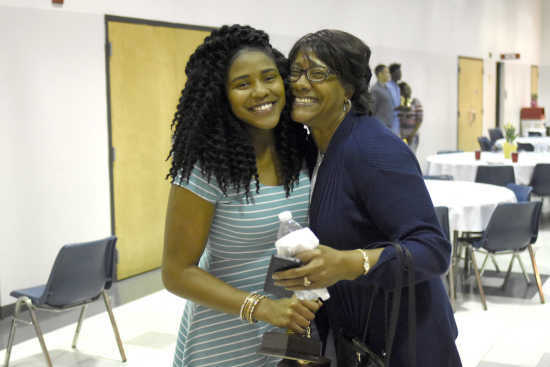 Both were honored at the 58th annual Poplar Bluff Letter Club Basketball Banquet at the Black River Coliseum, which started with a keynote address by Southeast Missouri State men's basketball coach Rick Ray. Mitchell brings the Gray Award to Sikeston for the first time in the same year the Lady Bulldogs won the SEMO Conference regular season outright for the first time in school history. "It's shocking, very shocking. I didn't think it was going to be me because there were so many tough players," Mitchell said. "I knew I was one of the good ones but to be called the best is a pretty amazing feeling right now." Mitchell led Sikeston in scoring with 14 points and 12 rebounds per game. The junior also had 1.7 assists, 2.6 steals and shot 48 percent from the floor. Mitchell was a 29 percent from three and shot 62 percent from free throw. Mitchell also scoring award after averaging 19 points in conference play this season. "We became more as one on the court this year, we really grew as a team," Mitchell said. "I attribute all of my success to my team." Mitchell was named to the All-Conference and All-District teams as well as a Semoball Awards finalist for Player of the Year as a sophomore. Sikeston coach Matt Schonhoff saw her transform into a dynamic player last season and built the offense around her this year. "We had conversations on how to make us better and one was for her to really get better on her outside shot," Schonhoff said. "Before practice our girls have a 3-point competition drill and they do it religiously and it made them better, it made her better. It just made the team better." Young is the first athlete to be named the most outstanding SEMO Conference player in both basketball and football since Charleston's Lamont Frazier took home the Carr and Gibbs Trophies in 1989. Young is the fifth Cape Central player to win the award and the first since T.J. Tisdell won it in 2012. "It means a lot to me, more than I could've imagined," Young said. "To me, it's the perfect way to end your senior year. I've basically won every single award, that's my dream right there." Cape Central coach Drew Church was proud to see one of the best players he's ever coached grab the conference's top honor. "If there's a kid that deserves it, it's Al," Church said. "He's been a varsity player for four years and its been a pleasure of mine to watch him mature throughout that time as a person, a man and a leader." Young, who will play football at Southeast Missouri State next year, led the Tigers in scoring at 21.5 points per game. He added six assists and 8.5 rebounds per game. Young's best offensive performance came at West County's expense midway through the season. The 6-foot-1 senior poured in a game-high 34 points and followed it up a little over a week later with a game-high 23 points in Cape Central's 73-63 upset victory over Sikeston, then ranked No. 1 in Class 4. "He was our leader on the floor. He did the majority of our scoring and in tough times our kids looked to him to see how he was going to react and then they followed. "He has everything a coach looks for in a player." With talents like Poplar Bluff's Mercedus Leech, Sikeston's Fred Thatch and Dominique Dyes, Jackson's Jacob Smith and New Madird County Central's Javarcus Word in the conference, Young was surprised to win the honor. "To be in the mix with Fred and Leech, the other guys -- it's crazy. I didn't even think I'd have a chance," Young said. "I want to thank God and all of the great players in the SEMO Conference, because with them challenging me it made me step my game up a lot." The Tigers reached the Class 4 District 1 finals in two of Young's four varsity seasons, winning it once in 2014. Young ended his career with 14 points and six rebounds in a district championship loss to Sikeston. "I hope I've helped put Cape Central and this conference on the map because I remember my freshman year when coach Church put me in there I was like, 'I don't know what to do' and now I've got younger kids looking at me to lead them," Young said. "It's been so fun to be that guy, compete in one of the best conferences and with some of the best athletes around." 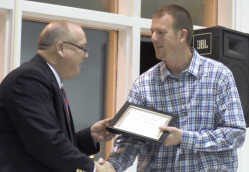 The Sikeston coaching staff also swept Coach of the Year Awards. Schonhoff took home the honor for the second straight year as the Lady Bulldogs reached their second straight district title game and set the program record for wins in a season with 22. Fresh off a fourth place finish in Class 4, Sikeston boys coach Gregg Holifield won the award on the boys side. Holifield has a 446-217 overall record, including 340 wins with the Bulldogs and guided them to a 28-3 finish. Leech was the top scorer in conference games, averaging 26.7 points per game, which gave the freshman the boys scoring title. Leech was also tops in free-throw shooting at 80 percent (90-111). Cassidi Tomsu of Jackson led the girls. The SEMO Conference also recognized longtime Kennett coach, teacher, administrator, school board member and fan Terry Turlington with the Tom Hoover Lifetime Achievement Award. Turlington took a few moments to reflect on just how competitive the SEMO Conference has been and continues to be. "In 15 years as a Kennett coach I never went into a SEMO Conference game feeling that I was going to outcoach the opponent. For the most part you can say that about today's matchups and that's the way it ought to be," Turlington said. "You have a high standard to uphold and being in this conference is something to be proud of."